Brindle Berry (Garcinia Cambogia / Garcinia Gummi-gutta) other names: Acide Hydroxycitrique, AHC, Brindal Berry, Brindle Berry, Cambogia gummi-guta, Garcinia Cambogi, Garcinia cambogia, Garcinia gummi-guta, Garcinia quaesita, Gorikapuli, Hydroxycitrate, Hydroxycitric Acid, HCA, Kankusta, Malabar Tamarind, Mangostana cambogia, Tamarinier de Malabar, Vrikshamla. 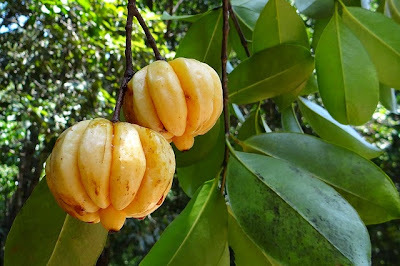 Brindle berry (Garcinia Gummi-gutta) is a tropical plant belonging to the Garcinia genus and is indigenous to Indonesia. Although called a berry, the fruit of this plant resembles a small pumpkin and its color varies from green to light yellow. In recent times, brindle berry has been in focus of the media owing to its supposed impact on weight loss. However, this claim is yet to be corroborated by any clinical study. Precisely speaking, brindle berry is among the many Garcinia species that are related closely and belong to the Guttiferae plant family. 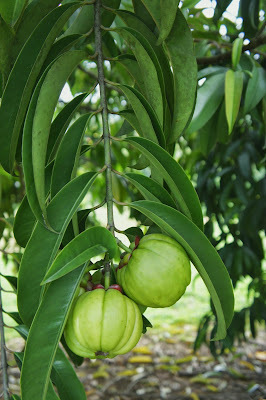 The fruit of this plant has a slender skin and deep straight up lobes and their size may vary from being equal to a grapefruit to an orange. In fact, brindle berry resembles a greenish, yellowish or a reddish pumpkin. However, this fruit may be found in a wide range of colors. The color of the rinds or peel of the fruit turns black or deep brown when they are dried up and preserved either for storing or extraction. An extract obtained from brindle berry and its rind is widely used in several natural products meant for aiding weight loss. This extract is actually hydroxycitric acid (HCA) and some people assert that it not only restrains hunger, but also facilitates in burning fats. Studies undertaken on animals have supported such claims, but the results of subsequent trials on humans have been vague. Brindle berry is cultivated for the plant’s fruit. 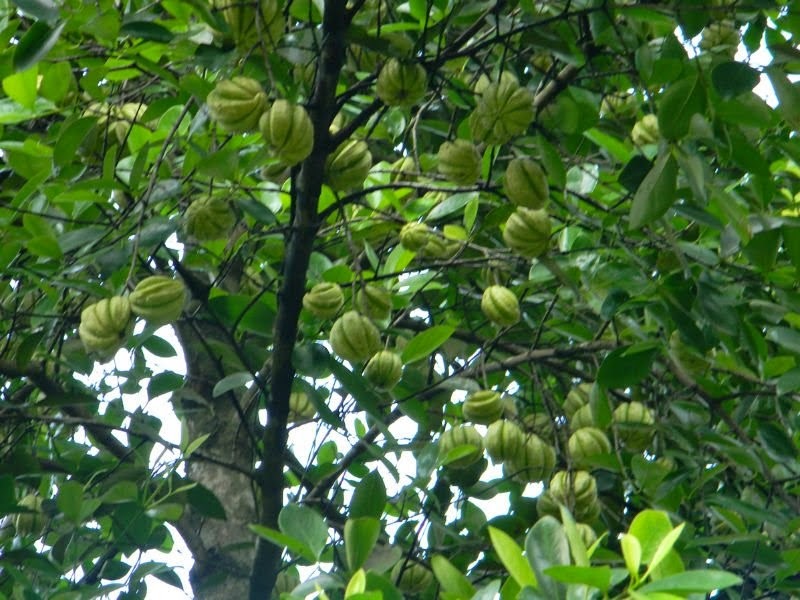 This plant prospers in most tropical or damp forests and is extensively grown in Southeast Asia, Kerala in India and also in the western and central regions of Africa. In the western coast of south India, brindle berry is commonly known as ‘Malabar tamarind’ and is used for culinary purposes along with tamarind (scientific name Tamarindus indica). While the brindle berry is a substantially huge evergreen tree, the tamarind plant is comparatively small. In a number of places, brindle berry is also known as ‘goraka’ or just as ‘kattcha puli’ (meaning a souring fruit). Consuming brindle berry is useful for enhancing the general energy levels, as the calories consumed by us are redirected to produce glycogen - the major source of our body’s energy. In other words, if you are following a low carb diet or a weight loss regimen, consuming brindle berry will not make you feel dizzy or weak. People following most weight loss program usually experience these symptoms. Instead, brindle berry will help to sustain your energy all through, thereby encourage you to continue with your weight loss plans. In addition, brindle berry is beneficial for people who want to maintain a perfect body weight. Brindle berry can be used in the form of a supplement for losing extra weight naturally as well as maintaining a perfect health and fitness. In addition, this natural substance possesses anti-viral as well as anti-inflammatory attributes and, hence, it is useful for boosting our immune system and protecting us against various ailments, including problems related to the bowels like dysentery and constipation, rheumatism, delayed menstruation, infections, common cold, tumours, the Ebola virus, liver troubles and also intestinal worms. Brindle berry may also be excellently used to protect us from problems related to stomach acidity as well as the succeeding ulcers. Historically, brindle berry has been employed for curing gastric ulcers. A study published in 2002 suggests that this herb mainly acts by means of one of its constituents called garcinol. It has been shown that garcinol is effective in lessening acidity in the stomach as well as protecting the gastric mucosa. The rind or peel of this fruit possesses astringent attributes and this is the main reason for it being used historically for treating dysentery and diarrhea, in addition to treating conditions like duodenal and gastric ulcers. In recent times, it has been suggested that brindle berry possesses hepatoprotective abilities against external toxic substances, for instance, alcohol. Findings of a study undertaken recently demonstrated that this herb helped to prevent the liver cells from turning fibrotic. In addition, it was also found to be useful in stopping the harm caused by elevated levels of lipids in the bloodstream. This herb possesses a distinct sour-sweet flavour and, for several centuries, people in Southeast Asia have used it to prepare meals that are additionally filling. Hydroxycitric acid (HCA) is the active element in brindle berry. Gradually, this compound is becoming well accepted as a weight loss supplement. It is claimed that HCA not only suppresses appetite, but also lessens the ability of the body to create adipose tissue (fatty tissues) when one overeats. The extract obtained from the rind of brindle berry is also known to enhance fat oxidation (burning fats) and, at the same time, increase the intensity of the healthy high density lipo-protein (LDL) cholesterol, which is also known as ‘good’ cholesterol. Many clinical trials undertaken on humans have shown that the extracts of brindle berry also reduced the levels of low density lipo-protein (LDL) cholesterol, also known as ‘bad’ cholesterol, and triglycerides, thereby aiding in weight loss. Brindle berry also works to slow down lipid synthesis, thereby resulting in the formation of augmented glycogen in the liver. As a result, the liver sends a signal indicating that the person’s stomach is full. In turn, the brain sends signals that lessen appetite. Seemingly, consumption of brindle berry does not result in any familiar side effects in adults. However, it is advisable that some people should not use this natural medication. Experts are of the view that children, pregnant women and nursing mothers, people who have diabetes mellitus, which occurs owing to insulin deficit, and those with Alzheimer’s disease or any other type of dementia diseases, should avoid taking brindle berry. It is believed that if people who have Alzheimer’s disease take brindle berry, the hydroxycitric acid (HCA) contained by this fruit may form acetylcholine inside the brain. On the other hand, people with diabetes may be influenced by the inclination of HCA to reduce the blood sugar levels. On the other hand, when healthy adults take this herbal product, it will help to restrain their cravings for carbohydrates, especially sweets. Being akin to herbs, the same standards do not apply in the case of brindle berry supplements and medications known as prescription drugs. In other words, when you are using these supplements in conjunction with specific prescription drugs to treat any ailment or medical condition, it may potentially interact with those drugs, thereby making the drugs (not the brindle berry supplements) less effectual in curing the condition. Therefore, if you plan to use brindle berry for weight loss, it is advisable that you should essentially check with your physician or any qualified healthcare professional whether it would suit your needs. Majority of the people using products enclosing extracts of brindle berry or hydroxycitric acid usually do not experience any difficulty with the supplement. On the other hand, there are people who experience allergic reactions following use of brindle berry. However, the signs as well as the symptoms of these conditions/ reactions may differ from one individual to another - the common symptoms being rash, swollen tongue and mouth, hives, congested feeling in the throat that will not only make it difficult to swallow liquids and foods, but also make breathing problematic. Although majority of the firms manufacturing weight loss supplement will now assert that using brindle berry does not have any known side effect, several people have reported that they experienced a number of comparatively negligible reactions, counting headaches/ migraines, nausea and stomach upset after taking the supplement. However, as the number of clinical trials involving brindle berry extract has been very limited, it may be quite difficult to identify the reasons for such adverse side effects.